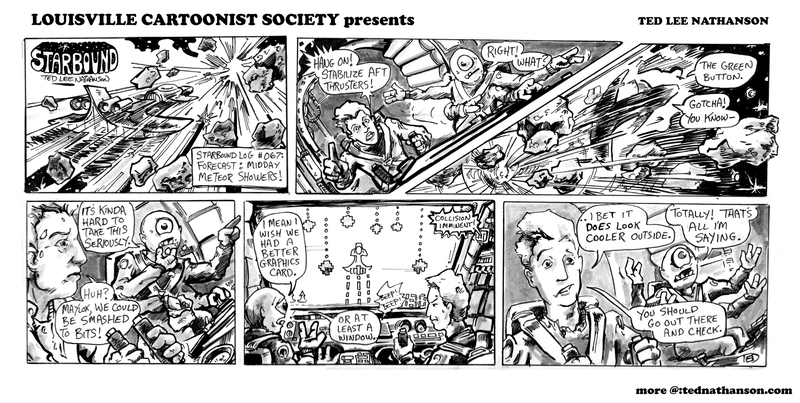 This week in the LEO- the second Starbound strip! Starbound tells the story of Dave Newton and Maylox, two astro-custodians on an indefinite mission to the farthest extremes of the universe. Usually, though they just hang out while the ship computers do the work. The Louisville Cartoonist Society Spotlight comic is a partnership between the LCS and the LEO to promote and showcase Louisville’s cartoonists. Each week, a different local artist is featured. Email me for more info. I was featured in this Sunday’s Courier Journal – you can find the article here. From “The Walking Dead” to “The Green Lantern” and “X-Men,” comic books have become a major force in shaping pop culture. With Free Comic Book Day coming up Saturday, why do you think comics have become so enduring and influential after years of being passed off as kids’ stuff? They got overlooked because they’re things we enjoy when we’re kids. We feel a need to move past them when we become adults — the public perception is that they’re all funny animals and superheroes. But the way comics combine images and text helps create a much more rich experience for readers. The comic comes alive in your brain. It’s an interesting visual language — and you see that language showing up in TV, video games and movies. Free Comic Day! Is Saturday May 7th at your Local Comic Shop! Take a loved one! 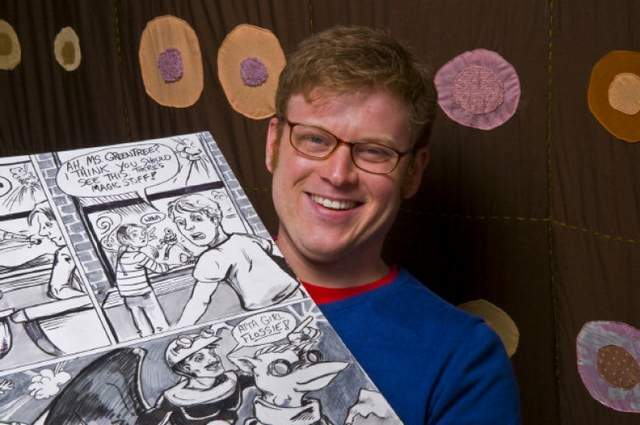 Thanks to Joe Lord at the Courier Journal being a comics booster. Being interviewed is strange. You just blab for 20 minutes and hope that you say something that halfway expresses your thoughts. I’m sure going through my remarks for something cogent and useful was like panning for gold nuggets. Beyond the standard ‘Comics! Not just for kids!’ trope, I was hoping to get across the fact that comics are a unique art form- that the problem is one of perception. Comics can be about anything- I personally believe the most interesting comics show us things we don’t normally see- this accounts for superhero/fantasy stories ( with their larger than life figures, and world warping action) and funny animals ( with fantasy elements like f’rinstance talking animals) being so dominant in the form. But that ability to show as well as tell can yield some other benefits, with today’s ‘lit comics’ using comics to show character’s emotional /interior realities, or the difference between someone’s thought and action-and some just plain smart comics- like Secret Science Alliance- using the plasticity of the comics page to weave the characters in and out of their own story. The potential is huge. Superman was created by two teenagers in Ohio during the Depression. He ( and the avalanche of superheroes that followed) was a fantasy valve for not just his creators but a nation who took comfort in fantasies of strength, power, and the ability not only to know what to do in all situations, but to be able effect a change in the world around you. I’d say superheroes are resonating again because we ( culturally, right now in 2011) don’t feel powerful. We want myths again. Comics, like sci-fi and sports, have been a nursery for the kind of fan-driven culture that the internet has made commonplace. What started as zines, and letter writing to your favorite comic, has become San Diego ComicCon. The net works as the kind of voluntary community that fans have had for years. For as many people put original content on the web, there are 20 that just get together to talk about stuff they enjoy. We’re all geeks now, because it’s easy to be. But comic culture was primed for the kind of cataloging and ongoing discussion that the internet makes possible. The Charles Dickens thing. People like serialized entertainment- ongoing stories with multiple characters interacting in a vast fictional universe. TV has just started to really do this- with limited success because of the demands of the form. People have started their own serialized stories with online multiplayer roleplaying. Comics has a lock on this. Ask a long term fan about the joys of Marvel Universe continuity sometime.